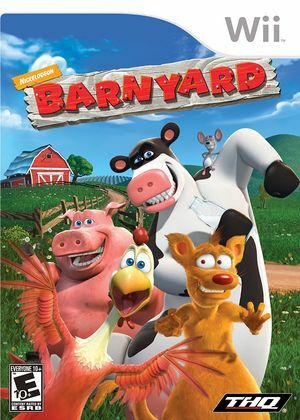 Barnyard is a 2006 party game based on the animated film of the same name. Since it does not follow the script of the movie, the game instead allows the player to create a cow, boy or girl, and choose different fur colors and patterns. Once the character creation process is completed, the player can begin to do missions for other characters. They can also receive missions through their cell phones, via text message. In the beginning the player may only explore inside the barnyard, but after several of missions revolving around the main characters the player receives a key to the barnyard gate and a key for a bicycle, and the player is able to explore other parts of the neighborhood. Also, the missions cannot be skipped; they must be completed in order for the game to advance. Then, eventually, after a multitude of missions, the player will have to complete a boss level involving coyotes, and then the player finishes the game and is free to roam. Two odd black boxes on the upper left corner of the screen. Fixed by disabling EFB Copies to Texture Only. Refer issue 10708. The graph below charts the compatibility with Barnyard since Dolphin's 2.0 release, listing revisions only where a compatibility change occurred. This page was last edited on 1 September 2018, at 21:43.